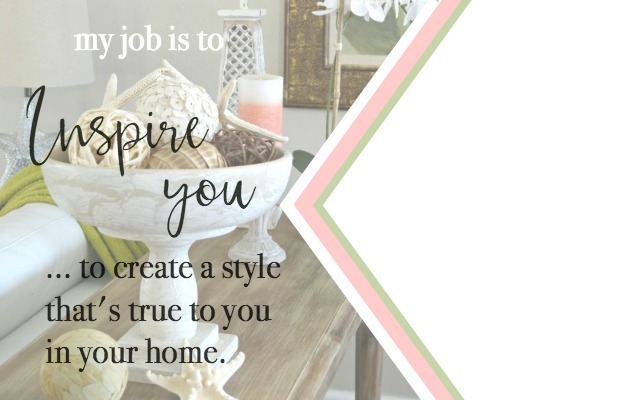 Today I’m sharing how to make a DIY vintage ladder for under ten dollars and give it an easy rustic finish for the perfect home decor item. Most people don’t think ten dollars goes very far nowadays. Usually it doesn’t, unless you’re a creative or a Power Tool Challenge Team Member! 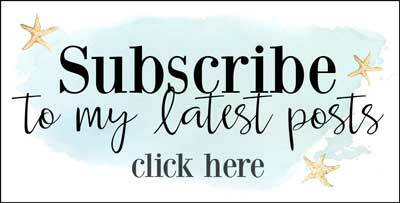 Not only is the team sharing some rockin’ projects this month, that all cost $10 or less to make, we are opening up the challenge to our readers! 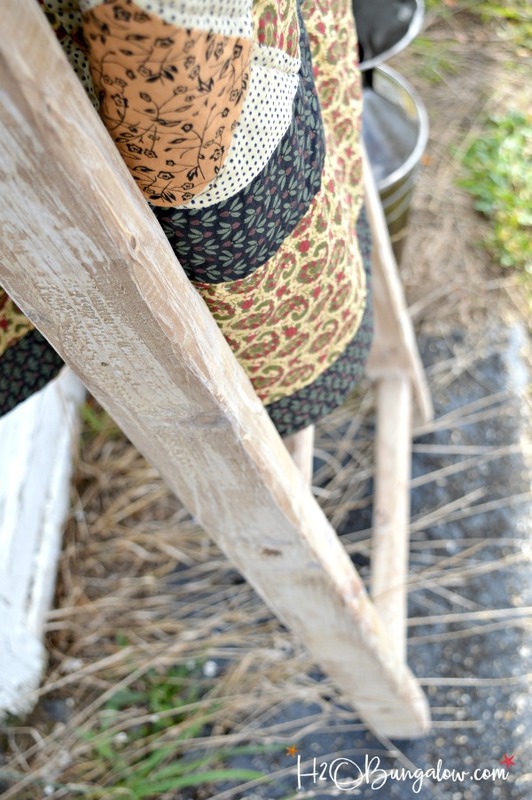 Check out my rustic DIY vintage ladder and the team’s projects below. So now let’s talk about your project. You ready for the details? We have a winner! 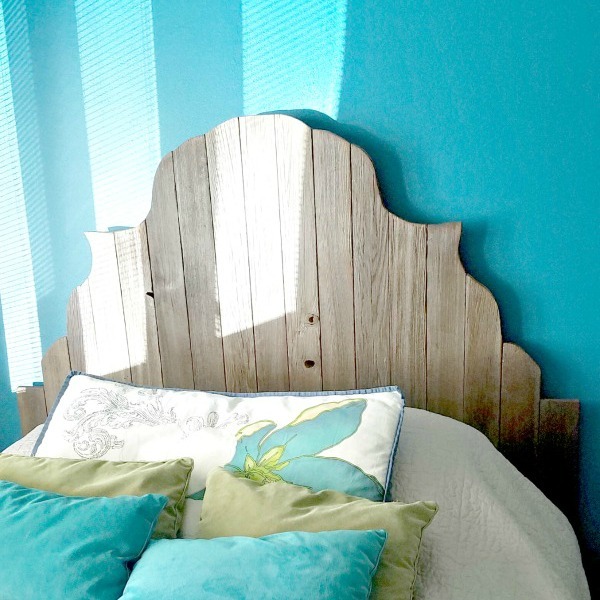 The team voted on the best entry and Shawna S DIY headboard was the winner! See all the project entries in the link below. Ready for my tutorial to make a budget DIY blanket ladder? 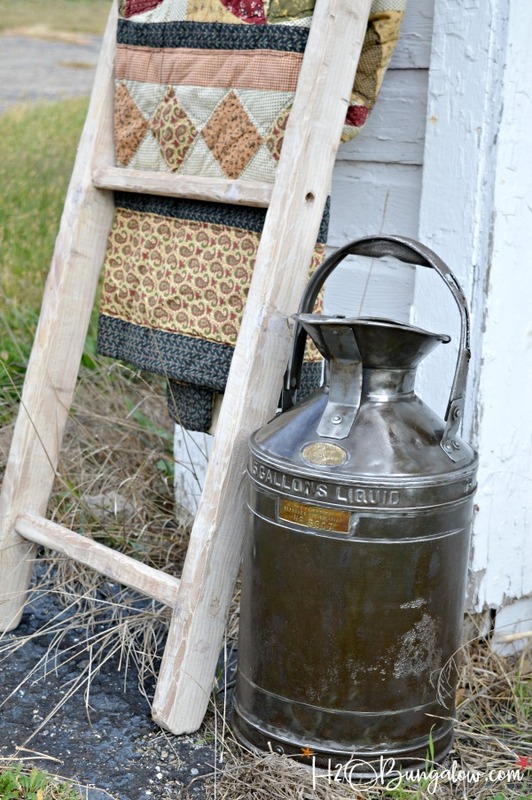 Here’s my tutorial to build a decorative rustic vintage ladder. Some of you may know by now that I’m obsessed with old things. Old furniture, time worn patina and cool vintage pieces all make my heart go pitter patter 🙂 You may also have noticed in my supply list above there isn’t any hardware listed. Nope, none. It’s not a mistake. My DIY vintage ladder replicates how furniture was made Pre-Civil War and in old barn construction before nails were available. I used pegs to assemble my ladder. It’s sturdy and added the character of a time-worn piece. Best of all this project cost under $10 to make. How to make a DIY vintage ladder for under ten dollars. 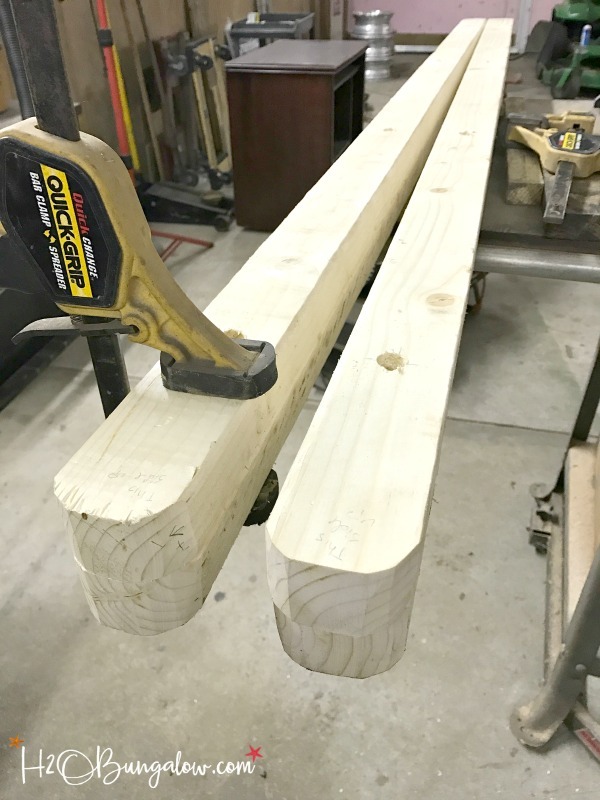 Supplies to make a vintage peg style ladder with no hardware. 1. Using a grinder or orbital sander, start by clamping the two ladder sides together and rounding both ends. Make a mark on your sides and tops so you’ll be able to line up these two parts again later. I made 2 ladders which is why there are 2 side sets below. 2. Mark 6″ from the top and bottom. Next mark where you’ll place your rungs by dividing up the remaining length. I used 4 rungs, I think the ladder would look better with 5, (I went back and forth for a while on this and should have listened to my self talk). Make your mark on the center where the peg hole will connect the rung to the ladder side. 3. 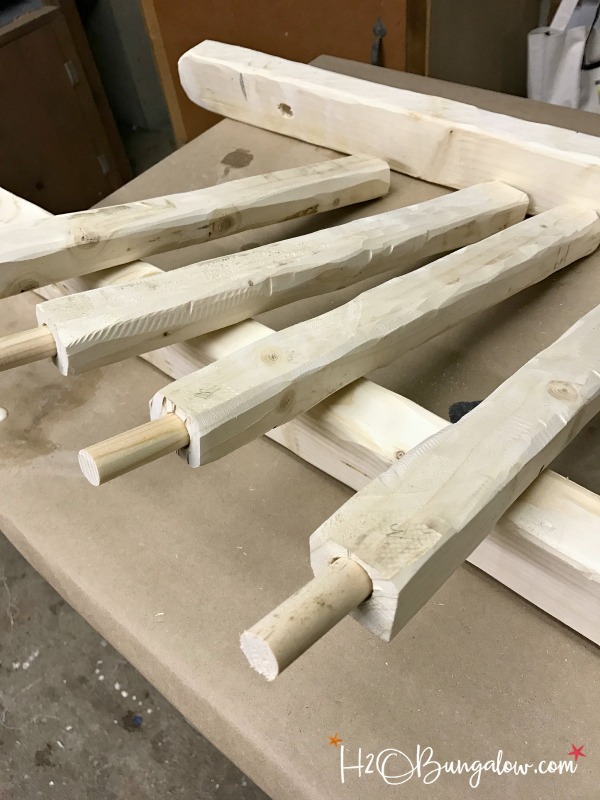 With the two ladder sides clamped together, drill the 5/8″ peg holes. 4. Distress the wood with a grinder or random orbital sander. Round off the rungs and add some wear to the sides of the ladder. Don’t be afraid to nick and mar the wood, the more worn the wood the better on this step! 5. Drill a pilot hole and then a 2″ hole into the end of each ladder rung. It helps to hold the ladder rung in a clamp to drill the hole straight. 6. Check your marks to be sure your sides are lined up like they were when you drilled them. 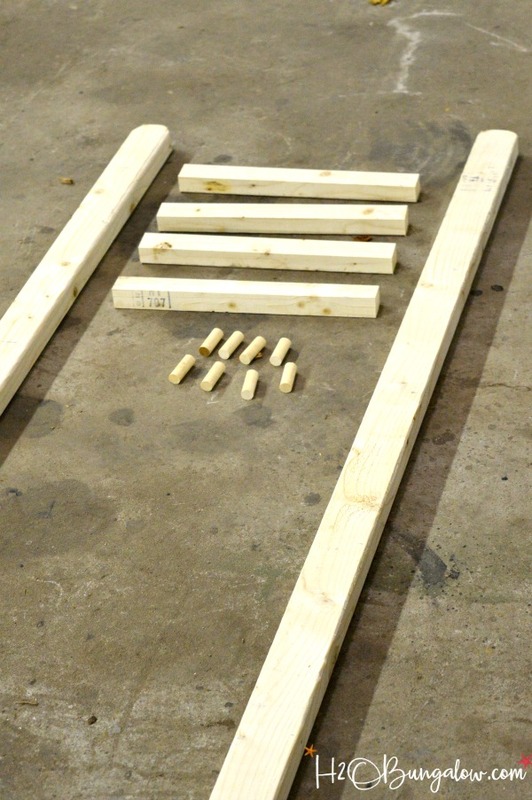 Assemble the DIY vintage ladder by putting a generous amount of wood glue into the rung end and inserting a peg. Do this for all the rungs. Assemble the rungs along one side and then the other. Tap with a rubber mallet as needed. Wipe away any dripping glue with a damp rag. Let sit 24 hours for the glue to dry and cure. 1. To age the wood so it looks like it’s sat outside for years you’ll need to give it patina. Start by applying a layer of my Homemade Tea Stain and allow it to dry overnight. 2. 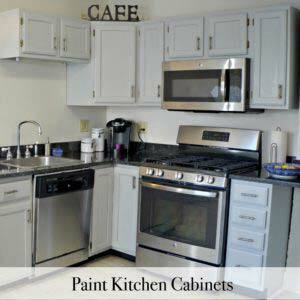 Dilute the white paint with water and make a watery opaque wash. 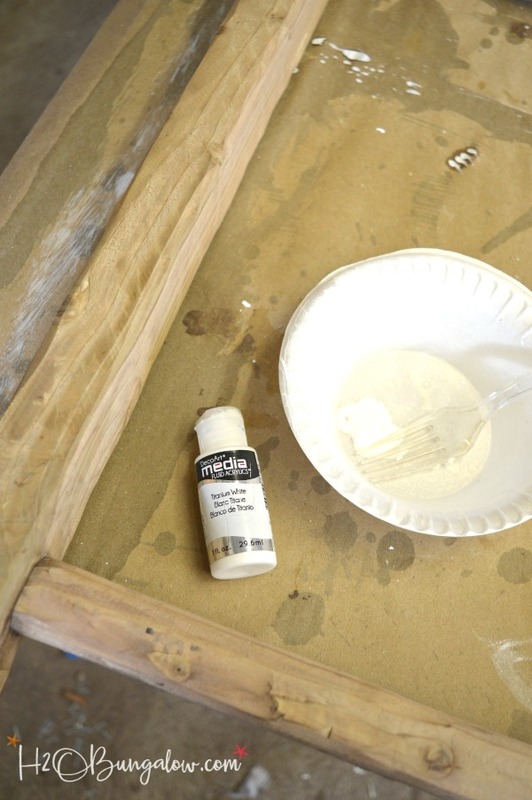 Using the chip brush randomly apply the wash to the wood. You don’t want to “paint” a solid layer on, just heavier in spots and none in others. Allow to dry. Keep in mind this is a decorative piece only. 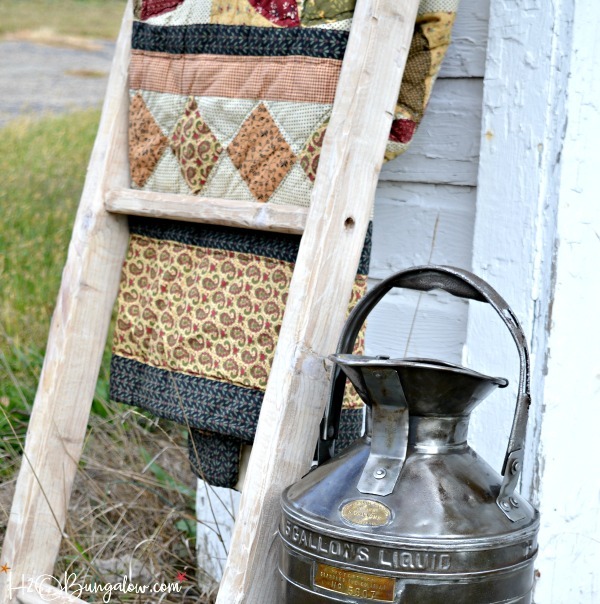 I’m planning on using my rustic DIY vintage ladder to hold blankets and throws. The peg holes give the rustic ladder character, and I love the old world style of not using any hardware in the construction. It’s sturdy too. 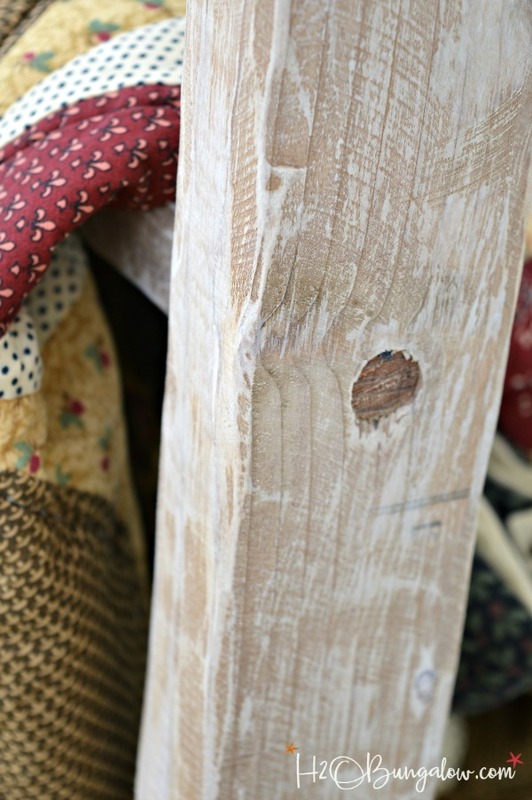 Where would you put a rustic DIY vintage ladder in your home? 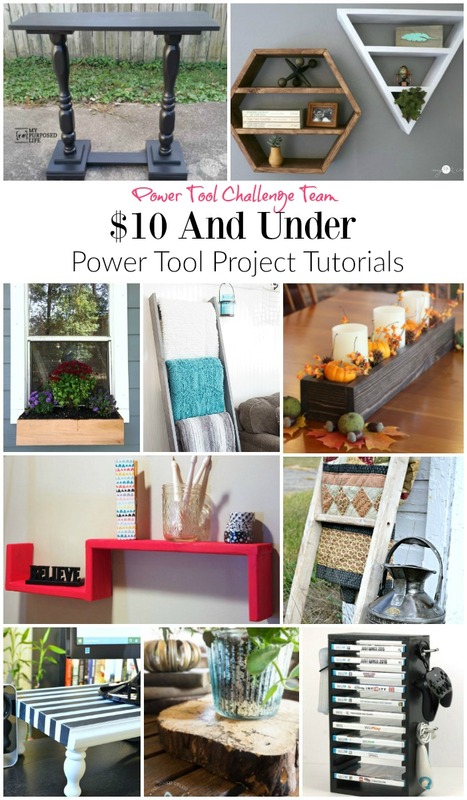 Don’t forget we want to see your best $10 power tool project too! The Reader Challenge is open until 11/10! I love your distressing! It gives the ladder so much character and charm. 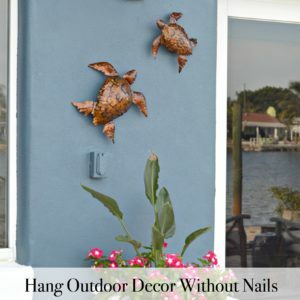 This would be a perfect way to add to your Christmas decor! Thanks for sharing your tutorial with us at Merry Monday this week! 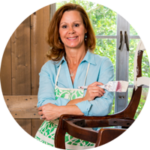 Hi Marie & thank you:) I loved using the grinder to distress this project, talk about fast! You are so right about this fitting in for Christmas decor. I’ll use this in so many different ways during the year. 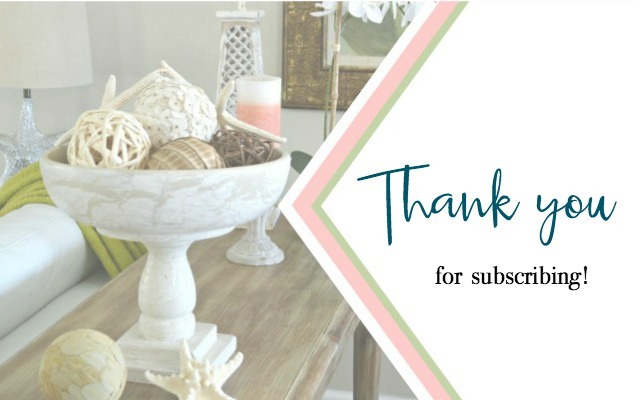 Thanks so much for your visit & hosting an awesome party! 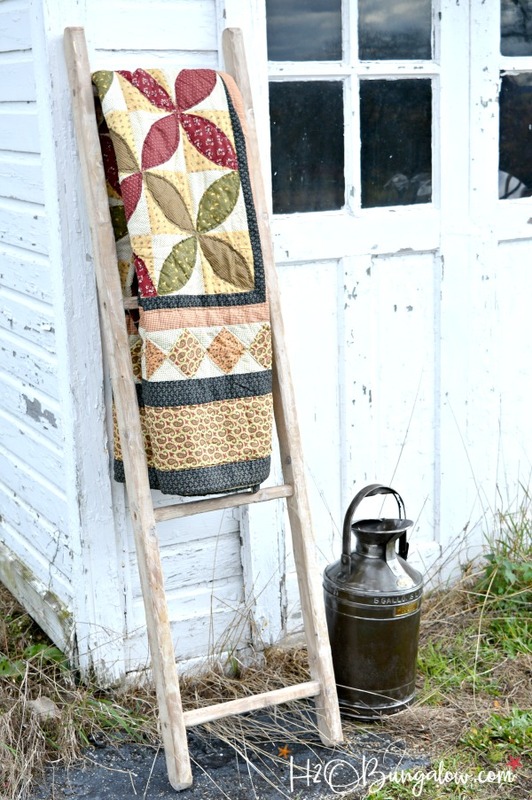 My quilt ladder is one of my favorite things in my house. I love it because it displays my quilts, plus it doesn’t take up much space in my small house. I like all of your ideas here! Hi Randi! I love a good blanket ladder too. I’ve wanted one for the longest time. Building one for under $10 made this project even better! Glad you like my projects I have a blast creating them. 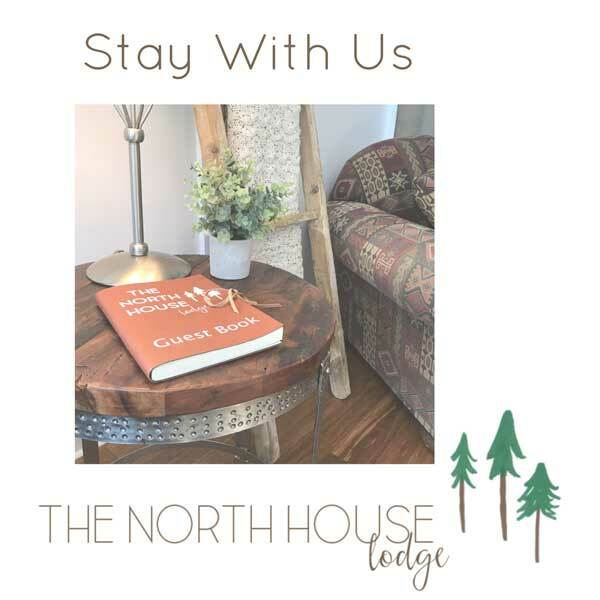 Thanks so much for your visit! Adorable! I’m in love with the character you gave it. It’s perfectly old looking with the use of the dowels and rounded off ends. Fantastic job!!! Hi Robin & thank you! This was a fun project and not so hard to create. Constructing it with the dowels gave it so much more character. Now I’m thinking about what else I can build with a peg construction Thanks so much for your visit and sweet comment! It truly looks worn and weathered. No one would guess it was made of brand new wood! Hi Angie & thank you! I have a serious love of old anything so this project was especially fun to make & recreate an old look. Thanks so much for your visit! Wendi that is so gorgeous. I can’t believe you just made it, you aged it perfectly. Great minds think alike 😉 LOVE the finish on your ladder! They do Maryann! I loved your finish too, especially the grey stain. I’m having to be creative since I’m traveling and not near my own supplies. You can’t go wrong with a vinegar stain in a pinch! Amazing! This looks like you rescued it from an old barn and that it’s a true antique. I love the quilt that you’ve displayed with it and also that cool can. I’d love to know what the tag on that can says. Hi Paula & thanks! I made this to look like an old ladder in a barn. I walked by it several times to be sure I remembered the wear and details. Funny you mention the can. We just picked it up for $15 at a flea market, it was caked with grime & none of the labels were visible. After we cleaned it up we looked up the labels and its pre 1900! It’s a 5 gallon oil measuring can from a company in Philadelphia. Seriously girl, you come up with the great ideas and I’m always blown way by your DIY skills! You rocked the challenge and I just love the time worn look of this ladder. Beautiful photo of the finished piece too! Hi Marie & thank you!! I’m limited in what I can make since I’m traveling but loved this idea. So much that I made 2 ladders. You guys will all see why next week 🙂 Everything is photogenic here I’m going to be spoiled! Hi Mindi! LOL… The grinding was the fun part! I totally got into creating an authentically worn ladder, especially at the price I made it for! Thanks for stopping by! Your ladder is gorgeous~ I must make one! I love the photo of it propped against that old chippy barn! Well done Wendi, well done. Pinned. Thanks Jeanie! I’m happy with the way it turned out:) I can’t wait to start using it too! Your ladder looks so perfectly “old”. I think you did a super job on making it look so rustic. Hi Gail & thank you 🙂 I had fun on this project and completely got into distressing it to look old and worn. I made two of them and can’t wait to place them where they belong…very soon! I love the ladder! I can’t believe that was less than $10!! So creative and pretty! 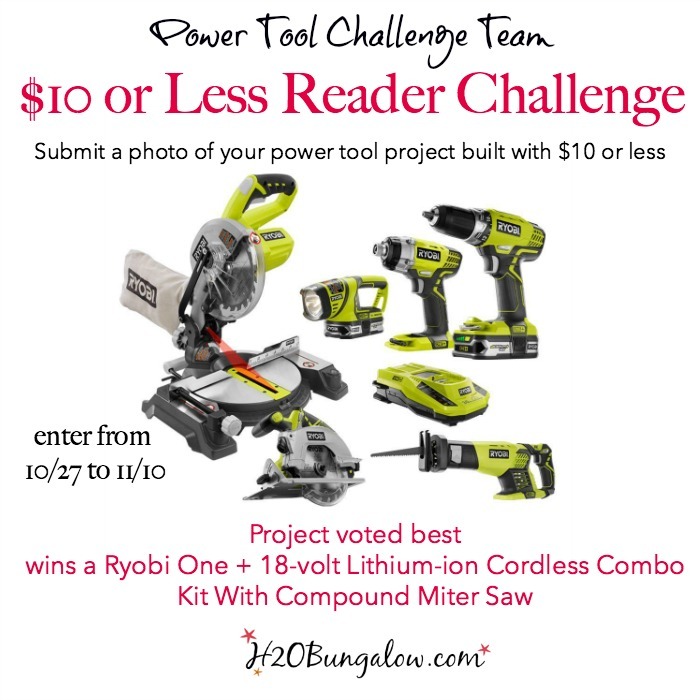 Thank you for organizing and including me in the Power Tool Challenge! Hi Karen & thank you! I’ve had a ladder project on my wish list for the longest time. Since I’m close to New England where everything is old and has history I was inspired to create something fitting for the area. Your project was super too, thanks for joining in!